Afternoon Tea is the quintessentially English pick me up and when you start your Christmas shopping in London over the next few weeks why not pair it up with one of these delicious Afternoon Tea options all available in Central London. Looking for the best luxury hotels in London? Or the best spas in London? Availability: 24th November – 30th December at 1:30pm, 3:30pm, 5:30pm and 7:30pm sittings. Afternoon Tea has been an institution at Fortnum & Mason for centuries. This iconic London landmark has been brewing and importing tea since 1707 and offers a wide array of blends on its menu, with expert tearistas available to guide guests through the selection. Tea is served in the elegant surroundings of the Diamond Jubilee Tea Salon, with entertainment provided by the resident pianist. 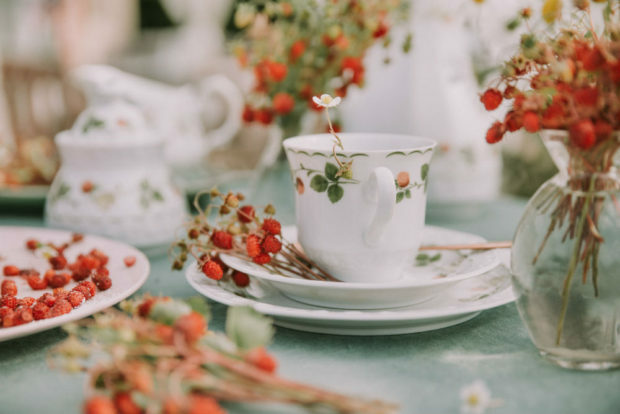 As well as an assortment of teas, there are delicate finger sandwiches, home baked scones served with generous amounts of cream, curd and jams, as well as cakes and patisseries from the Cake Carriage. Situated within the trendy Haymarket hotel, the vibrantly designed Brumus restaurant serves up an equally colourful afternoon tea. Highlights include Pimm’s jelly, ginger sponge and Chantilly cream and a strawberry panna cotta tartlet. Guests are treated to a selection of classic and unusual teas, coffees or hot chocolates or cap opt to upgrade to a glass of Pommery Brut Royal NV champagne. Reduced sugar, gluten free and vegan afternoon tea options are also available upon request. Prices: Afternoon tea £24 per person, with a glass of champagne £31.50 per person. Price: Best of BritishAfternoon Tea £29.75 per person, Champagne Afternoon Tea £40 per person, Chocolate Afternoon Tea £29.75 per person. With its open plan kitchen and sophisticated yet relaxed setting, Leicester Square Kitchen, known for its contemporary Mexican and Peruvian dishes, serves up an indulgent afternoon tea too. Delight in homemade finger sandwiches on artisan breads, plain and chocolate scones with lavishing’s of cream and jam and a selection of pastries with a Peruvian twist. Highlights include sugar-coated doughnuts with Peruvian chocolate sauce and the avocado mousse with pistachio and chocolate soil. Gluten free options available. For an afternoon indulgence packed with tempting treats and playful twists, TEA TOTAL at W London combines iconic tea-time classics, experiential English garden inspired sweet creations and crystallised shots from the bar’s latest cocktail menu. Available to devour in the vibrant bar and lounge, The Perception at W London, TEA TOTAL will provide the perfect daytime pick-me-up that is almost too beautiful to eat. Prices: Tea Total £37 per person, £42 per person with a glass of prosecco. Located high above the West End in a glass atrium filled with natural light, the Terrace on Piccadilly serves a traditional afternoon tea with a contemporary twist. Sandwiches include smoked salmon pinwheels and devilled egg on beetroot loaf and the tea selection incudes a Rosy White Fig. Then there is mouth-watering pastries and home-made scones with jam and clotted cream. The terrace provides fantastic views of Piccadilly, making it the perfect spot to recharge. Enjoy two hours of unlimited prosecco for just £10 extra. Availability: Daily: 2 – 6pm. The culture and lifestyle brand, Maison Assouline is located in the unique surroundings of a grand former Edwardian banking hall on Piccadilly. The stylish establishment is adorned with beautiful books, bespoke furniture and curious antiques and is the first location in London to be named a Gucci place, selected as it reflects the taste and values of this famous fashion house. Guests can choose from three afternoon teas; Moroccan, Parisian and a sweet Japanese option. Highlights include rose and raspberry filled French pastries and a Japanese sweet red bean mochi.